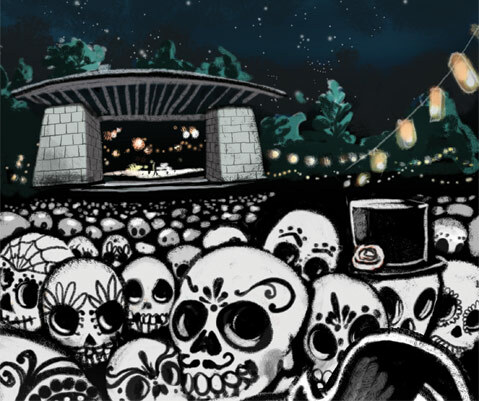 Consider the over-the-top stage sets, delightfully out-there costume choices, and abundance of candy-skull paraphernalia, and it becomes hard to imagine a group more apt to headline the Santa Barbara Bowl’s first-ever El Día de los Muertos Celebration than The Flaming Lips. It’s fitting then that the Oklahoma City psych rockers hit town on the one day of the year devoted to memorializing, reveling, and partying in honor of the dead. “The planets most definitely aligned for this one,” said Moss Jacobs, VP of talent for Nederlander Concerts. Blessed with the “opportunity of a lifetime” earlier this year, Jacobs reached out to longtime friend and co-conspirator Nicole Pierpont, an artist and part-time Santa Barbaran who has spent years scheming with Jacobs about a big, festive blowout at the Bowl. And an event it most definitely is. With Pierpont art-directing from afar, Friday’s celebration is quickly shaping up to be as extraordinary and extravagant as its headlining act. “We’re creating an altar in the Glen for all of the musicians who have played the Bowl that have passed away,” Pierpont explained. In addition to the overhaul of the venue’s famed Jerry Garcia Glen, decorations and art installations will be strewn throughout the space, including a pair of 20-foot skulls built by Santa Barbara artist Eric Lehman, handmade decor from S.B. High School’s VADA students, and the Santa Barbara High School Don Riders bike club, who will tow “mobile altars” around the venue. Also contributing to the takeover are Kalpulli Huitzilin Ihuan Xochitl Aztec dancers, Ventura-based traditional banda Zacamundo, pet altars made by the folks at Casa Dolores, and Santa Barbara nonprofit LifeChronicles, who will supply the face paint. Additionally, Pierpont hints at a surprise performance from Proximity Theatre Company, which she says showgoers will not want to miss. Attendees are also highly encouraged to dress up.